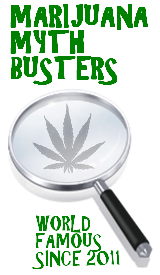 Marijuana Mythbusters » Weed Tea… Made from the best stuff on Earth! This entry was posted by Mythbuster on April 15, 2011 at 6:55 am, and is filed under Pot Polls. Follow any responses to this post through RSS 2.0.You can leave a response or trackback from your own site. greetings, very good weblog, and a very good understand! just one for my bookmarks. Thanks for the support. Check back soon, we’ll be busting myths tomorrow and should have the video up for 4/20.